We adopted a dog from the Humane Society a month ago. Her name is Zoey! She is a beagle / german shepherd mix. I am obsessed with her. Before we even got a dog my husband made the rule “no dogs on the bed.” So I knew I had to make her the coolest bed ever. After her first vet check-up, we found out she is starting to get arthritis in her back legs (she is 7 years old). For the old lady, I splurged on the large-sized therapeutic dog bed mattress at L.L. Bean. Then I got to work designing the frame to go around it. Front Cut Diagram. 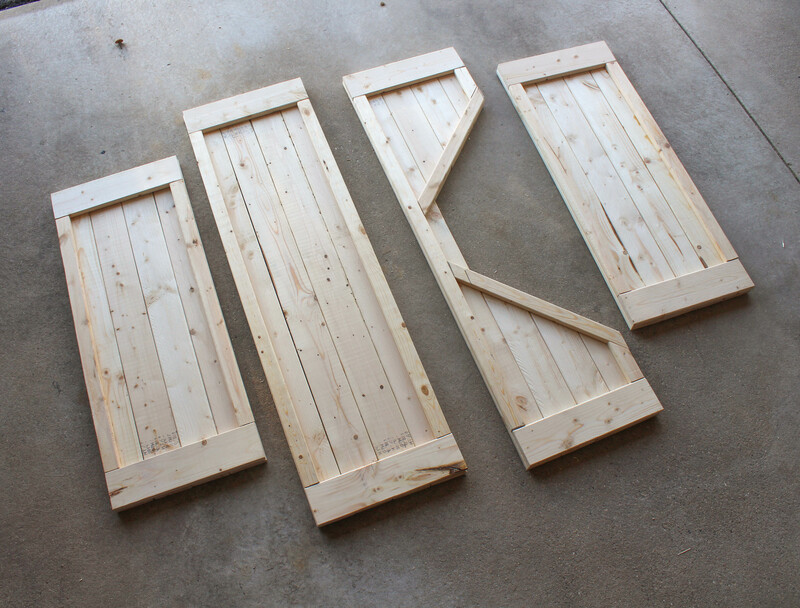 TIP: Cut the inside pieces first in order to accurately cut the outside frame. First I found a couple of free pallets that I planned on deconstructing. I scratched that idea after I came to my senses. Pallets are horrible to work with. I learned that from making this pallet artwork. Not only are they hard to tear apart, they have uneven widths, splinters and nails everywhere (I hate sanding)…they can be toxic. From pesticides, to E.coli, to salmonella, to dangerous chemicals that were spilled on these pallets…you just have no idea where these pallets have been. Making furniture out of pallets is a bad idea. Putting pallets in a baby’s room is an even worse idea (I cringe every time I open Pinterest and see this). Please do your research and be smart about how you recycle pallets! So! What is a good alternative? Furring strips!!! It is VERY inexpensive wood with imperfections like pallets. I discovered this type of wood when I was searching for something to make my indoor basketball hoop out of. At Home Depot, a 1 in x 4 in x 8 ft furring strip is $1.84. 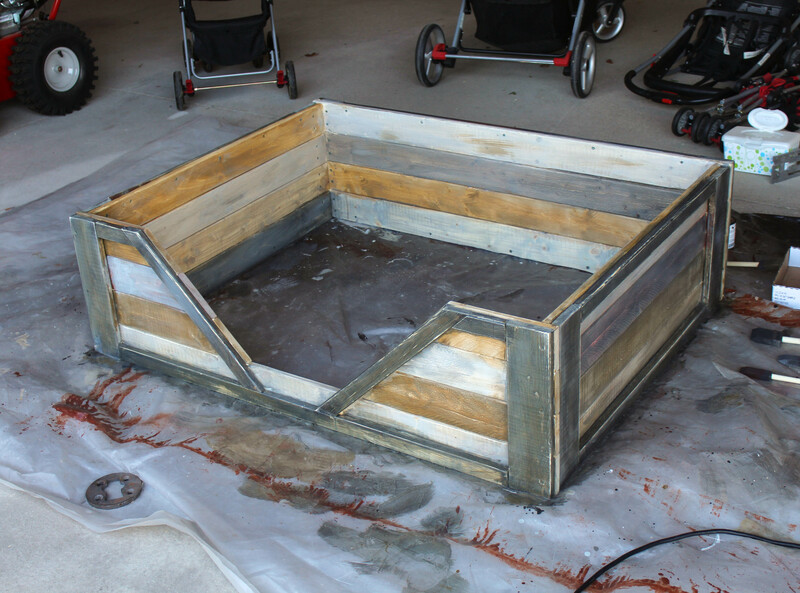 Then I laid it all out and used wood glue to temporarily hold the outside frame to the inside pieces. Once the glue was dry, I flipped it over and screwed it together with the short 1-1/4″ self tapping deck screws. Then I screwed all four sides together with the longer3″ self tapping deck screws. I bought several colors of sample sized wood stains at Home Depot. These tiny sample size cans are only a few dollars each and you can do so much with them! I started slapping the stain on, trying to mimic old weathered wood by staining each board a different shade. I didn’t tape anything off and it definitely wasn’t perfect, but I let it dry overnight. The next morning I sanded everything and went back with a black stain. Working quickly and in small sections, I brushed it into all the cracks and wiped it with baby wipes to help make the sections stand out better and give it an old, antique look. To finish it, I painted the plywood bottom a solid dark grey and screwed it on to the top section. I put magic sliders under it so we can move it easily and without damaging the floor (the final product is really heavy). For picture purposes, I put one of our fur throws down. It looks very pretty, but she doesn’t get to keep that. Next, I am planning on making fitted sheets out of flannel or fleece for the mattress so they can be easily washed! 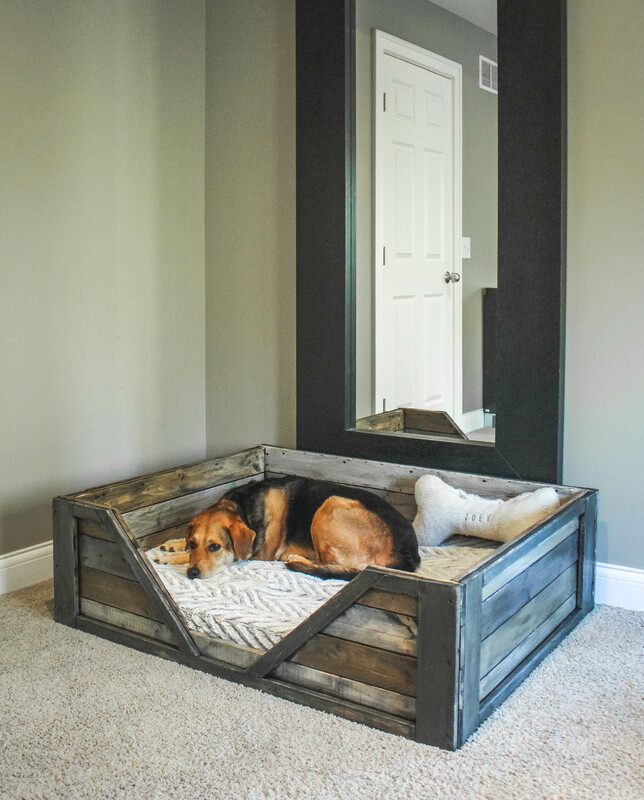 We don’t let our dog on the bed either but, he owns the rest of the house 😉 I neeeeed to make this. Just beautiful. What size did you cut your boards? Great project! I’m going to attempt to do this. How much of a gap did you leave for the entryway? It looks about 8″ or so? Please let us know about the sheets too! The opening at its widest is 31”, and if you follow that angled board all the way to the bottom, the width is 6-1/2″. Hope that makes sense! This is really a wonderful project. Thank you for sharing! Do you remember what colors of stain you used? I am making something similar and LOVE the colors you used! I’m sorry, I wish I did! I don’t have the containers anymore. I bought them at Home Depot. They have an outdoor stain brochure with all the colors to choose from. I just picked some shades of grey/neutrals and a mustard to work with. I mixed some colors together as well. My kids and I are going to be making this this weekend. I am just concerned on the opening. Not sure I will be able to pull that off. Do you remember the length of each board? I saw your comment about the widest point is 31″ and the bottom of it being 6 1/2″, just looking for a little more detail if you have it. It might look a little complicated, but I promise it’s easy! I just revised and re-uploaded the diagrams, plus I added an extra diagram that should help with cutting the front. Thank you so much. I looked at the changes and that helps a lot. My wife and I built this over two days this past week. I just came across it by searching for dog beds on Google. Thank you very much for the idea! Our dog loves it so far! I was confused at first when the bottom didn’t match the initial measurements once we got the sides put together. Now that you’ve uploaded the new diagram, I feel much better! I wish that I could post a pic, but I don’t know how on this page. How much was your total cost approximately? This is a work of genius. Hi! Found this page on Pinterest (of course) and just had to tell you I love this bed and I’m going to try to make it. My husband and I just got adopted by an abused, starving German Shepherd boy that someone was kind enough to drop off at our house! 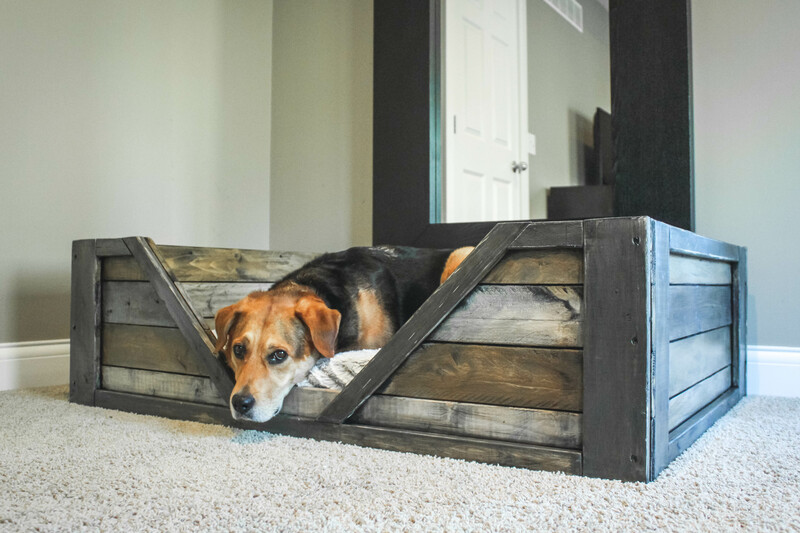 He’s not ever been inside before & I’m pretty sure he’s never had a bed before ’cause he’s not liking either of the two beds we have for him…I’m hoping he’ll love this awesome bed. Thank you for sharing these plans! Btw, Zoey is so cute! When they are not used to beds it takes a while to settle into one. Put treats on it, offer lavish praise for using it, etc. Patience will be rewarded. Just a suggestion, but it might Change the dimensions, buy a baby crib mattress from Kmart, Walmart etc for 40 bucks to cut the costs. They can be wiped down easily and sheets are available. I too love this doggie bed! Oh and thank you for mentioning the sanitation issue with pallets. I made a smaller size for my new puppy, hopefully I can post a picture, turned out great!! Pingback: 35+ of the Most Incredible Ideas & DIY you need to try! I have a german shepherd baby, she’s 7 months old. My motives leaned to aesthetic a bit. I didn’t like the way it looked to throw a dog bed in the corner. And my girl didn’t care for the feeling of falling off. So this was a solution for both issues. We built one with 1×3’s because that was all that was available. Not wanting to spend a lot on plywood, we bought some reclaimed pieces and pieced the bottom on. Which worked remarkably well and saved us $20. For the stain, there wasn’t a whole lot available in the samples. So I ended up base coating with varathane’s weathered gray, then followed up with kona. Resulting in a dark rich color, with blue undertones. I really love it. Thanks for the awesome tutorial. It adds a ton of character and comfort to my living room. Thank you for posting the plans and I can vouch for using beds the size of crib since I have an incontinent dog and the waterproof mattress covers come in handy. A tip about pallets, ripping them apart is almost no work at all with a Pallet Paw. I ripped up so many pallets, I had to build a rack to store all the lumber. Loved your design. Would LOVE to show you photo of my creation based off of your design. It was so simple to follow. Gorgeous! I totally agree. Pallets are a nightmare to work with. I’m super impressed by how skilled you are with wood – I am good with fabric, but don’t trust myself around saws :-). So I won’t try this out myself, but just wanted to say that this is terrific. Also, your pup looks adorable. So cute! I randomly saw this picture come up on my Facebook feed and felt compelled to comment because your dog is identical to my dog. We adopted him as a puppy and I think they are even the same age. I never comment on anything via social medi but just had to comment since they literally look like the exact same dog! I need to send you a picture. I meant to say Pinterest feed. I know it’s shot in the dark but you didn’t happen to get her from shelter in PA? I’m so sorry to hear about your dog! We got Zoey from a shelter in Michigan. She was surrendered by her original owner. I had so much fun making this with my boyfriend. Our dogs love it and it looks so classy in our room. I appreciate the plans, what you did was beautiful! I will say, pallets are a great resource. Just because you think they are difficult to work with, doesn’t make it a bad choice. As long as you know what to look for, and where you’re getting them from they are fine. Clearly there are a lot of people here that respect you, and your work, but leading everyone to believe that pallets are dangerous is wrong. Educating them on which to choose would be a better method. 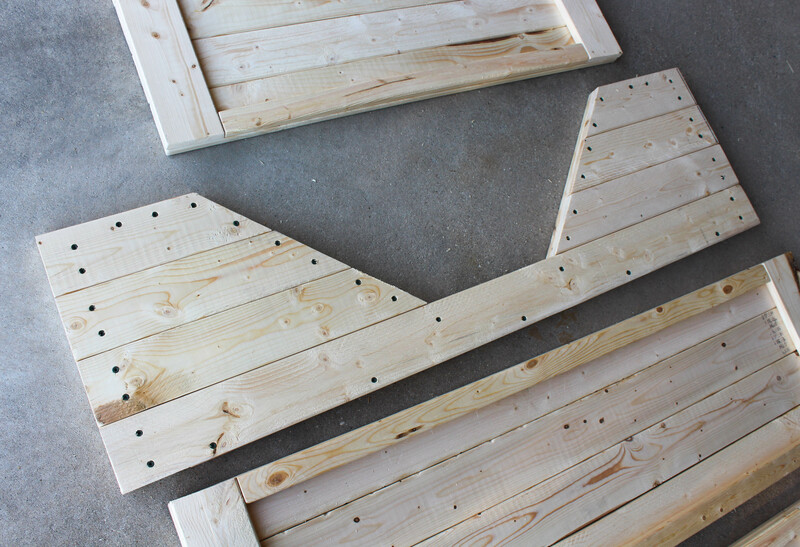 Also, there are so many different ways to disassemble pallets that make it so easy! Thanks for your input! I would totally be willing to overlook the difficulty/messiness of working with pallets if there wasn’t a safety issue. I do agree that theoretically there are pallets that are fine and safe to use. However, The life of a pallet is an adventurous one and almost impossible to track where they’ve been. After weighing to risks, I choose to use a “better safe than sorry” approach when it comes to my family. I encourage everyone to do their own research and choose for themselves. Pingback: Cucce per cani e gatti: 10 idee Fai da Te molto originali!